Large Knit Mink Ruffled Wrap / Shawl. This spectacular reversible knitted mink shawl wraps around you to add a special touch of dynamic glamor to your evening wear or your dinner suits. 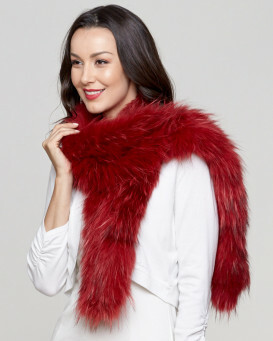 You will find yourself reaching for this lovely unique mink accessory all fall and winter season to complete every ensemble! It is one of our most popular shawls, our customers absolutely love it! This item can be worn in many different ways. Most ladies wear it with the bottom side up to make a wing collar shawl. Hidden hook and eye closures can be used to secure the shawl. Measurements: Center back length 35 inches, side to side 85 inches, 225 inch sweep, 4 inch mink ruffle. A wonderful gift selection! One size fits all. 4.5 / 5 from 32 customer reviews. "I ordered the mahogany and it is lovely. Very lightweight but warm and cuddly. Very happy with this purchase!" "I got the dark chocolate brown and love it. Beautiful, quality shawl with generous size for wrap around. Beautiful, shiny mink and love the small flair at the hem for a modern, young and flirty look. No weird smells or shedding of mink. Love it and would recommend it to anyone considering purchasing. Very rich looking. Was delivered very quickly." "I bought this in Whiskey, however returned it. First of all, the whiskey color is gorgeous. However, this did not work for me. I found it a bit small. I am 6 feet. Didn't fit me as full as I wanted. Additionally, when it was on, it kept slipping off my shoulders. Additionally, the back of it hit me midway down my back. Too small, but beautiful. Just didnt' work for my height." "All I can say is WOW!!! the delivery was super fast. The shawl is light weight and so soft with beautiful rich color. I'm petite 5'1" 100lbs and this wrap covers me abundantly. I am so overjoyed with my purchase I can't wait for cooler weather so I can wear it!!! Thank you Fur and Hat World ...."
"I LOVED this item's design, wonderfully large which is what I was looking for. However I was disappointed in the coloring of the Whiskey, and the fur was not soft, but rather prickly. I may consider it in the Mahagony. The service was absolutely superb!" "I've been wanting to buy my wife a mink shawl for years. This one is (relatively) affordable and she loves it! 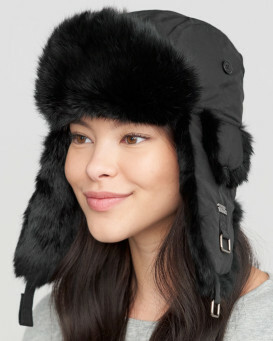 I had good luck with previous smaller purchases from Fur Hat World over the past couple of years (fur hats for ice fishing) so felt I could take the risk on spending more this time. Shipping was fast and the item was as expected." "Til hverdag og fest. Et fantastisk fint sjal, i god kvalitet. God nettside, oversiktig og rask levering, trygg betaling kan anbefales på det varmeste. Fantastick Beautiful made, i loved it. Very good quality, I received so many positiv comments, the website is very easy to use.I am very pleast, Tank you furhatworld."